- cost less that $1K. The reason why the R-SG37BPS is so affordable is because it is made in Malaysia, as far as I know. It is also not exactly a new model and has been around for a couple of years. Even the brochure available from Hitachi Singapore's website is printed in April 2012. The official Hitachi website states a net capacity of 365 litres based on JIS. The ISO capacity is actually 296 litres. This fridge comes with small water tank that is used by the automatic ice maker instead of a direct water inlet (tap). This makes the fridge portable although it is rarely a need to move your fridge unlike furniture. However, it saves the hassle and cost of plumbing works. 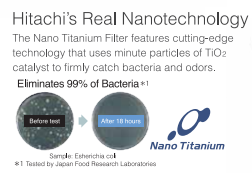 It is also equipped with Nano Titanium filters that is supposedly able to eliminate bacteria and odors. From my use so far, placing a used tea bag in the fridge gets rid of the odors better. It is powered by a inverter compressor which will consume approximately 423 kWh annually. It obtained 4 Green Ticks under the old Energy Labeling Scheme. However with the new rating scheme, it obtained only 1 Green Tick. The fridge will sound a soft alarm, which can be deactivated, if any of the doors are left opened for a minute or more. I wish it is louder so you can't miss it especially when you have an occasion where your place is typically noisier than normal. By the way the door grip is recessed so there are no handles sticking out which I prefer for so many reason including safety and aesthetics as it flushes with your cabinets. 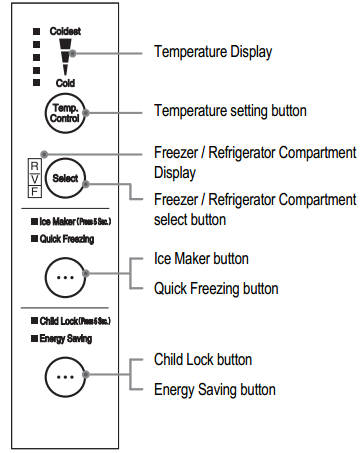 The fridge operation can be managed from the control panel located at the top left of the refrigerator door which is convenient. The temperature for the freezer and refrigerator can be set independently. By default it is set at the 3rd mark which is basically halfway from the coldest setting. The Child Lock function only works for the control panel and not the fridge doors. Since this panel is high up on the door for any child to reach (unless they climb onto something), I find this option redundant. You can turn on the Energy Saving function when storage volume is low or when you are away on a long vacation where the doors will not be opened for long time. It will automatically turn off temporarily when it detects that the temperature in the fridge has rises and because of this I turn it on during normal use. However, if fatty ice cream, etc, becomes soft or if dew appears, you should turn it off. If you are away for a long vacation, you should turn off the Ice Maker function as well and when you are back and need ice quickly, turn on Quick Freezing. The first thing that I noticed when I open up the fridge compartment is that it is pretty big. Not surprising since it is made up of 3/5 of the total capacity, which is enough for my family of 5. The white LED lighting is bright too which makes it easier to view the food being stored. There are a lot of pockets on the door for drinks, jam, eggs etc. If you are wondering why the bottom compartment of the refrigerator door can accommodate two rows of bottles/cartons, that is because the back of the refrigerator compartment slopes inwards around the 2nd shelf and below. It comes with a 3-way flexible shelf, which is great actually as you can fold it away to fit in tall jugs and the like. However, take note that there is only one of such shelf while the rest are fixed tempered glass shelves. At the bottom left of the fridge is where the water tank is stored and on the right is the Fresh Room sliding case for fresh meat, fish, prawn and process foodstuff that you do not want to freeze. The vegetable compartment is roomy enough and so far managed to keep my fruits and vegetable stay fresh longer as compared to my old fridge. I can't say for sure how effective it is as I have not made any actual comparison. The compartment is separated by a sliding case on top for fruits while the rest is for vegetables. You can also store your bottled drinks as shown if the refrigerator compartment is full. The freezer compartment, about 1/5 of the total capacity, could be bigger. We store loads of frozen stuff so the freezer was a tad too small. As with the vegetable compartment, it is separated by a sliding case for ice cubes on one side and for ice creams etc on the other. The case itself is for the other frozen stuff. You really need to pack in the frozen food nicely or you will not be able to make full use of the limited space. Always pull the top tray to the drawer door before closing the drawer door to ensure it will close properly. The ice compartment is big enough to store ice for a jug of cold drinks. Ice will be ready is an interval of about a few hours. So if you plan to make ice for a couple of jugs, you may have to store the ice out of the compartment so that new ice can be made or you can turn on the Quick Freezing function. A note of advice, change the water in the water tank when it runs low. Do not top it up. This will avoid the water that has absorbed the odors from the fridge ending up effecting the taste quality of the ice to be made. Overall I am very pleased with the fridge. There are ample space and I love that it makes ice automatically. 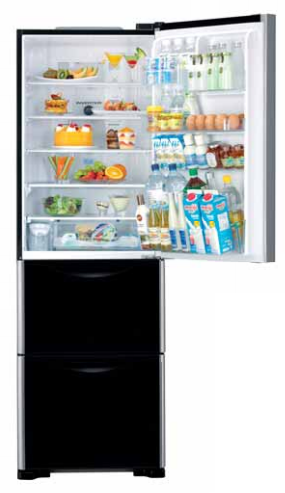 If you are looking for a fridge with same criteria as mine, you cannot go wrong with the R-SG37BPS. Do take note of the cons though. hi, thanks for the excellent and 'neutral' review. it is very helpful for me. however, based on the brochure from hitachi, it did mention 365L is based on ISO. Thanks for the info Kang Hai. Looks like Hitachi needs to get their act together and not release conflicting information. Based on their HK site, it states 365L is based on JIS.